The Observer this week has been running an advert in The Guardian with a picture that has caused much giggling hereabouts. From a doctor in the US: You may giggle, but lard from properly raised pigs is a nutritional gift. Lard is about 40 percent saturated (we all need saturated fats), 50 percent monounsaturated, and contains 10 percent polyunsaturated fatty acids. It is also one of our richest dietary sources of vitamin D. Good lard can combat diabetes and heart disease. What, you say? What of US recommendations to eat low fat foods? Let me ask you, if these recommendations are working, why does the US lead the world in obesity and fall behind in healthy longevity (Nationmaster.com)? We ate tons of lard a hundred years ago, when heart disease was almost unheard of. Let's get back to basics! Well quite. 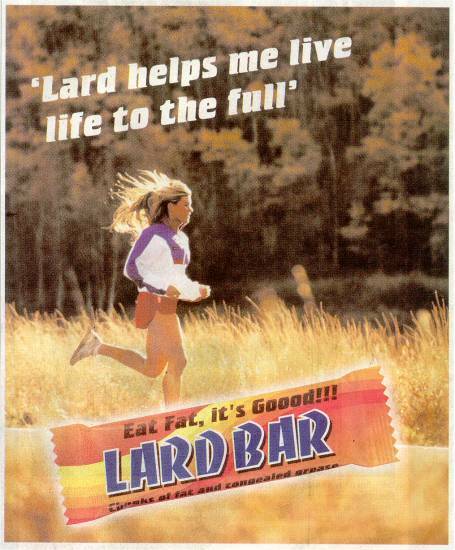 I love lard. In fact I've just had a bacon sandwich: fried rashers of free range streaky bacon wrapped in slices of home made organic bread, each one fried in lard on one side. With just a dash of ketchup what more could one desire?